If you have ever resided in Morgan County, especially in Martinsville, it is very likely that your life has been touched by Ruth Rusie in some way. This remarkable woman will turn 100 years old this October. Although that is a wonderful achievement, the list of what Rusie has contributed to the community and county since she came to Martinsville in the 1940s is extensive, wide-ranging, and amazing. Her involvement and contributions are too many to list comprehensively. Some include service to the Morgan County Coalition for Literacy, the Morgan County Public Library Foundation Board, the Martinsville Education Foundation Board, the Martinsville Literacy Club, Rotary and Kiwanis clubs, Greater Martinsville Chamber of Commerce, Community Foundation, City of Martinsville, United Way and the First Presbyterian Church in Martinsville. Rusie has been honored and recognized for her service. In 2008, she was named grand marshal of the 49th annual festival parade at her alma mater, DePauw University. 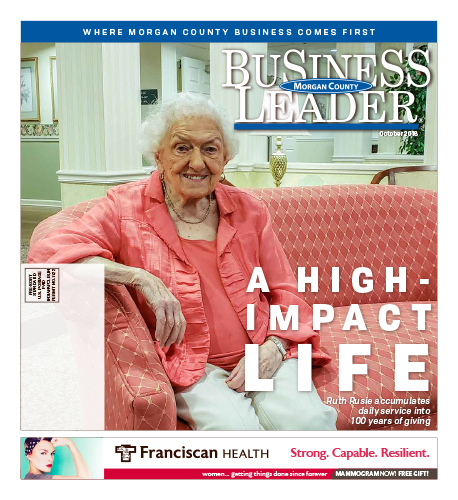 In 2014, she was named Senior Volunteer of the Year by CICOA Aging and In-Home Solutions, and in 2015 she received the Legacy Award from the Community Foundation of Morgan County. When viewing the list of projects and organizations that Ruth Rusie has been a part of, it is difficult to pinpoint exactly what it is that she cares most about. That is, until one steps back and looks at the person that is Ruth Rusie. Then it becomes evident. The thing Ruth Rusie cares about most is people.